Well, truth be told, it didn’t happen quite that “overnight.” I have always thought that the day I have kids, my climbing life would end. Climbing, guiding, being a professional athlete, etc. would disappear from my life, and I therefore needed to do every climb I possibly could before then. I wouldn’t say that the pressure came as much from my environment as it did from me. I knew I should have kids, but I didn’t know when the right time would be, after which climb I should decide to give it all up for kids. People have often said that they haven’t done some of the climbs they wanted to do because they wanted to be a responsible parent, which is most likely why I always felt that my life as a professional would end with children. Maybe it’s in response to that that I decided to become a guide so that the day I would have kids I could justifiably still go out and play, all the while working and getting some exercise and coming home without the need to go out and do more training. That said, 2011 has so far been one of the most prolific and exciting years of my life. I got to climb in Antarctica, Thailand, Jordan, ski-guide all over the Alps (Silvretta, Bernina, Haute Route, etc. ), climb the Supercouloir with one of my best friends, Tania, do a one-day ascent of the north face of the Eiger with my husband, Adam, move into a great apartment that Adam remodeled while I was away in Antarctica and many other great moments shared with friends and family. Filled with all of these great experiences, I hit a bit of a wall in May. I was climbing with Adam on the Grand Capucin, one of the most world-class and spectacular peaks in the world, no less, when I realized that as much I loved climbing and guiding, I suddenly felt the urge for something more to balance out my life. Too much of a good thing can kill a good thing, is the saying, right? As I climbed up the soaked blank granite face, I realized that I just didn’t want to be there. A tough realization for a climber. I reached Adam and with tears in my voice and in my eyes, I told him that I just wanted to be home and make babies. With a look of terror in his eyes, he said, “You freak me out!” Yet, as hormones would have it, I got pregnant that night (I like to think so; it makes for a better story)—or around that time. 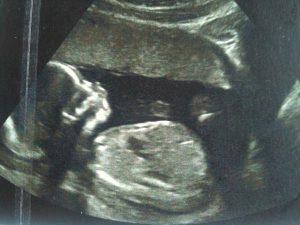 I quickly found out that I was pregnant and was elated. It’s not that I had wanted it that badly, but it felt like it was the right time for it. When I turned 25, I decided I should graduate from law school. When I turned 35 (this year), I knew that I should start thinking more seriously about kids. And I did. I think that I had known for a long time, that this year would be the year because last year, when I was trying to ascend Moonlight Buttress in Zion, I was so sad that winter arrived so early, preventing me from getting back on it, because I already knew deep down that I would be pregnant the following year. That feeling of elation faded with the realization that, well, I was pregnant. Not just in concept, but for real. Something was growing inside of me, something that would change my life as I know it forever. Those words had ruled my concept of parenthood, and I always felt that as a consequence my life as a climber should end with pregnancy. So I went from being elated to being downright sad, grieving the life I had worked so hard to build for myself, grieving my identity, wanting this baby but resenting it, feeling guilty for having these emotions that I was sure the baby would feel. I was confused, torn between what I thought I should feel and what I felt. July was a really difficult month for me. I was two months into my pregnancy and felt extremely stressed out about the idea of hurting the baby, with the constantly unstable weather patterns and having to modify all my guiding days and many other aspects of my life. I think it took getting injured for me sit back and understand that this wasn’t the end of my life as I knew it. I was climbing on the Weissmies on flat terrain when I missed a high step and landed shin-first on a knife-edge boulder, cutting my shin open to the bone. I continued guiding to the summit and down, and went to the doctor’s when I returned to the village below. While waiting to get stitched up, I was hit by a wave of heavy tears. I was like a two-year-old, inconsolable, weeping like I never had before. I took a few days off, rested and accepted the fact that I am pregnant and am lucky to be able to work while pregnant. Many other women have gone through this before and many will after me and it’s just a part of life, a part of making choices and working around them to make it work as best you can. I think that you can make parenthood whatever you want it to be and still be a responsible parent. Having kids doesn’t necessarily mean settling down. Maybe it will bring more structure to my life, forcing me to be more focused to keep achieving my dreams, but I hope that I won’t use my kids as an excuse to no longer pursue my dreams. That said, I know that my lifestyle is particular and fitting a kid in an already very busy schedule won’t be easy but I think my life will be all the more rich for it. After all, I picked guiding not just to share my passion with others, but also because I believe that it’s very compatible with parenthood. I get to exercise all day long and be available to my kid when I get home at night, not needing to go out and exercise some more. And during the off-season, I will possibly be more available than a 9-to-5 parent could be. I am now 3.5-months pregnant and have been guiding through the summer and loving every moment of it, since my little accident. The season is coming to an end and I am looking forward to climbing for myself again and finding the space to do other things that are more suited to pregnancy. Pregnancy is a lot like doing a first ascent. Although many people have done first ascents and have been gone through motherhood before, your own seems like the first of the first; you can only hope that all of the skills you have accumulated in your life until now will enable you to overcome the challenges ahead and lead you to a successful summit, this one this time being motherhood. Congrats on the decision, the future climber and happy family! From Ethiopia, Nico.